Where remote parts of the building need connecting via wireless, this outdoor access point is the first choice. Integrated antennas allow not only professional Wi-Fi coverage, but also high-speed point-to-point links. Fast 11ac Wi-Fi (Wi-Fi 5) eliminates the hassle of laying network cabling. Also available as a Bridge Kit. 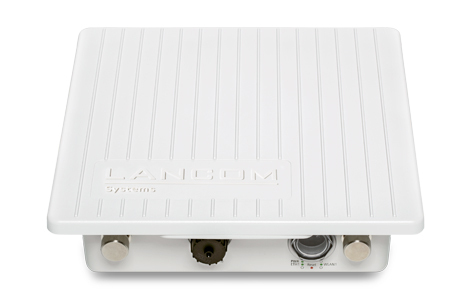 The LANCOM OAP-821 provides either reliable WLAN coverage in the 2.4-GHz frequency band or high-speed P2P links for connecting remote buildings in the 5-GHz band via IEEE 802.11ac with a net date rate of up to 250 Mbps. The LANCOM OAP-821 supports IEEE 802.11ac for highly powerful point-to-point links with up to 867 Mbps for wide coverage of open spaces and secure interconnection of remote buildings. Setting up a wireless network of this type spares you the need for laborious cable installations and expensive leased lines. Quick and easy network integration of the access points as well as automatic assignment of the configuration - without manual configuration. For WLAN controller or LANCOM Management Cloud-based installations, the access point receives an appropriate configuration immediately after network authentication.